An interesting ceremony took place at the Omeo methodist Church on Sunday, 20th inst, in the presence of a crowded congregation. 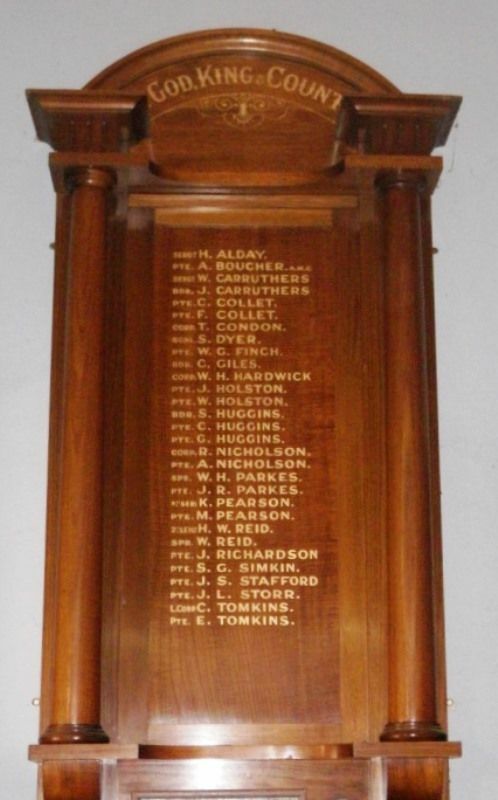 The Methodists of the Omeo district recently decided to obtain an honor roll in remembrance of the soldiers belonging to their community who had gone to the front, and a very handsome roll was prepared, with the names inscribed thereon. This was placed at the end of the church above the preacher's platform, and before the unveiling was covered with a Union Jack, other flags being also placed around the church. A special service of music and prayer was gone through, the choir giving as an anthem, Woodward's setting of Tennyson's poem, 'Crossing the Bar,' and as an offertory solo. Miss Daphne Forsyth sang "The Resurrection Morn." Rev. .E. C. Pallot conducted the service and took his text from the 9th chapter of Hebrews, selecting as his point of discourse that there is no redemption and no sacrifice without the shedding of blood; that it was the universal law, the lesson of Christ. It was only by sacrifice that we could attain to redemption, and that sacrifice must be by the shedding of blood. In unveiling the roll, Mr Pallot said it was in honor of the efforts of brave men who had offered themselves as a sacrifice for the human race, for Christ, and for the freedom of the world. After the unveiling, the choir and congregation sang "God Bless Our Splendid Men." Every Week (Bairnsdale, Vic), I November 1917.